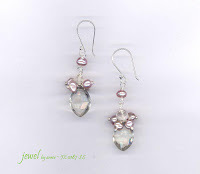 Faceted Prasiolite and Moonstones gemstones with Mauve Freshwater Pearls. This elegant earrings is handmade in 925 sterling silver. **Sorry, item sold. Please contact Jewel by Annie if you need a similar designs.